With how much focus has been placed on Oris’ dive watches, and even on their fairly innovative Artelier calibers (all offering 10-day power reserves), the brand’s motorsport collection has never really garnered the same kind of mainstream clout. That said, there are a lot of interesting aspects about this line of Oris watches, and on a personal level, the Chronoris in particular has been something I’ve long been fond of. 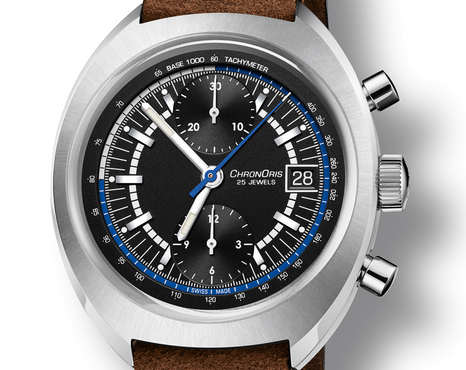 Its design screams ‘70s motorsport without feeling like it’s the least bit derivative of Heuer’s offerings of the era. Given the chance, I opted to grab some hands-on time with the Oris Chronoris Williams 40th Anniversary Limited Edition to see how it would hold up beyond its stylistic appeal. The Oris Chronoris Williams 40th Anniversary Limited Edition celebrates the Williams F1 racing team (Image: Oris). 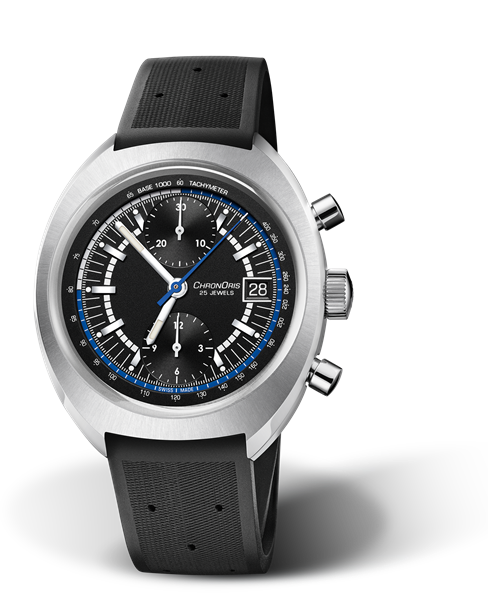 Even at a quick first glance, there’s a lot for me to love about the Chronoris Williams chronograph. Its case size and shape, for instance, is an absolute crowd pleaser. The slightly barrel/tonneau shaped chronograph is 40mm across, and thanks to very stubby lugs, I’d say it wears even smaller. As a trade-off, the case is definitely a bit on the pudgy side; however when on the wrist, the piece manages to not feel too bulky. The Chronoris collection is packed with vintage-inspired 1970s motorsport styling (Image: Oris). Its radially brushed bezel and polished sides are well-matched, as the additional polishing is complemented by the use of polished hands and applied indices. Its crystal has a faint dome to it, cut in a manner that avoids distortion when viewing the watch from a severe angle. Standard variations of the chronograph use orange accents, but in the case of the Chronoris Williams special edition, hints of blue are used in both the minute track, and for the chronograph seconds hand. 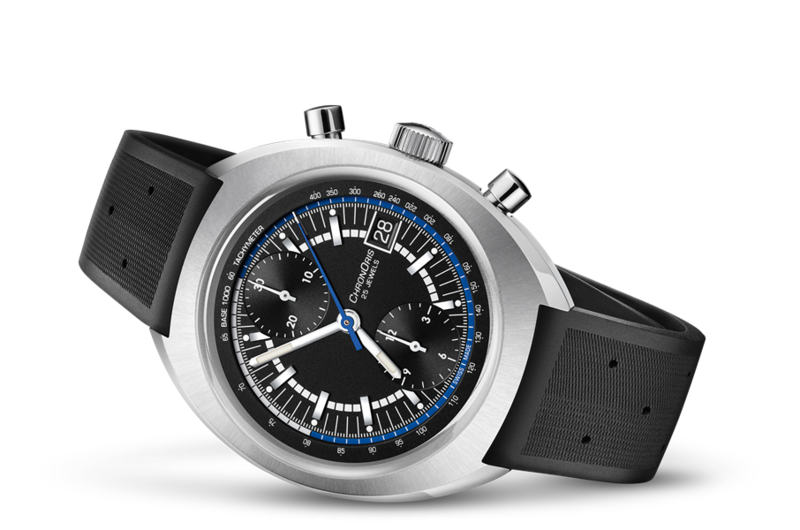 Blue is Williams Racing’s team color, and it is used on both the minute track and the seconds hand for the chronograph (Image: Oris). Aside from the case proportions and color scheme, a few things jump out at me instantly in regards to why I have a soft spot for this watch. 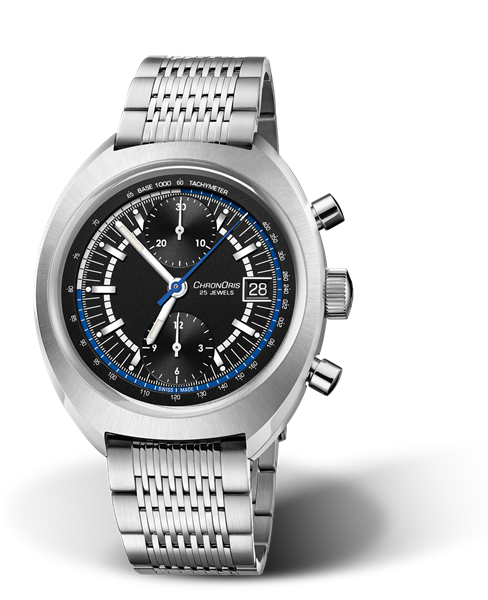 First is its chronograph sub-dial configuration. Though the Oris 673 caliber is based on a Valjoux 7750, Oris opted for the less common, two-register date configuration over the more standard, 3-register day-date layout, which you see from countless brands out there. I’m a big fan of 2-register chronographs in general, simply on account of there being less clutter on the dial; however more often than not, this configuration comes at the price of practicality. 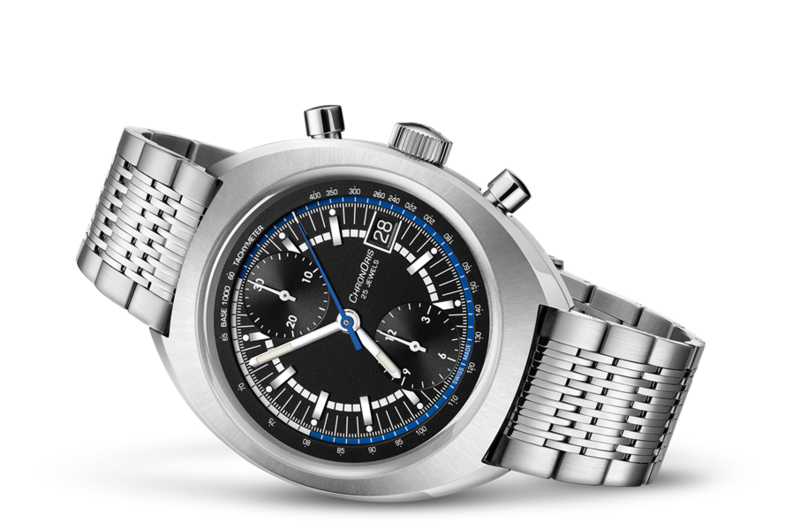 You see, in 2-register form, the vast majority of watches have a 30-minute chronograph sub-dial paired with running seconds. Given the option, I would always rather sacrifice running seconds in trade for a chronograph hours counter; however these offerings are few and far between (the Piaget Polo S and the Jaeger LeCoultre Polaris come to mind). Being Valjoux-based still makes sense in order to keep the piece budget-friendly, and its running stats aren’t horrible to boot. The caliber in the Chronoris is good for a power reserve of 48h. As noted above, the case proportions make the Chronoris quite comfortable on the wrist. Opting for the rubber strap variant, I was surprised to see it delivered with a deployant clasp rather than a tang buckle. The strap itself is reasonably supple, and the perforations in the rubber broaden towards the inside to help aid overall breathability. The Oris Chronoris Williams 40th Anniversary Limited Edition is available with the option of a rubber strap, leather strap, or metal bracelet (Image: Oris). Its pudgy case does have a little heft to it, so I wouldn’t be too keen on wearing its strap overly loose, nor would I contemplate swapping it onto a NATO strap. Speaking of, one of my core gripes with this watch is strap width. For some reason, Oris decided that 19mm was an appropriate choice for a lug width, making the selection of aftermarket straps quite limited, should you decide to change things up. This is an easy one in the grand scheme of things. 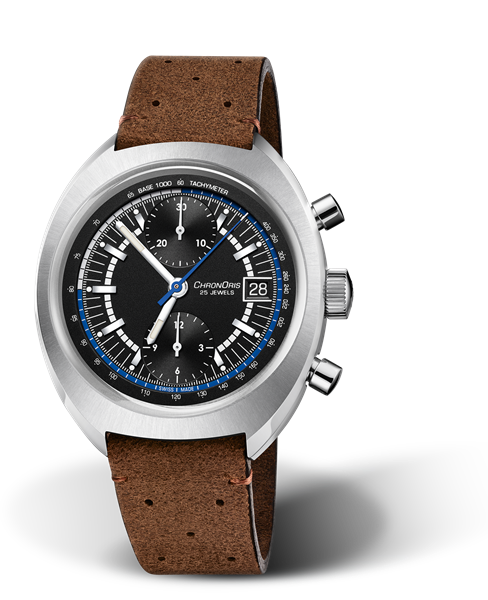 A well-executed vintage-themed chronograph that isn’t massive and costs less than $4,000 ($3,700 to be precise)? Other than being a bit disgruntled about strap options, this is the kind of watch that’s a bit hard to argue with. 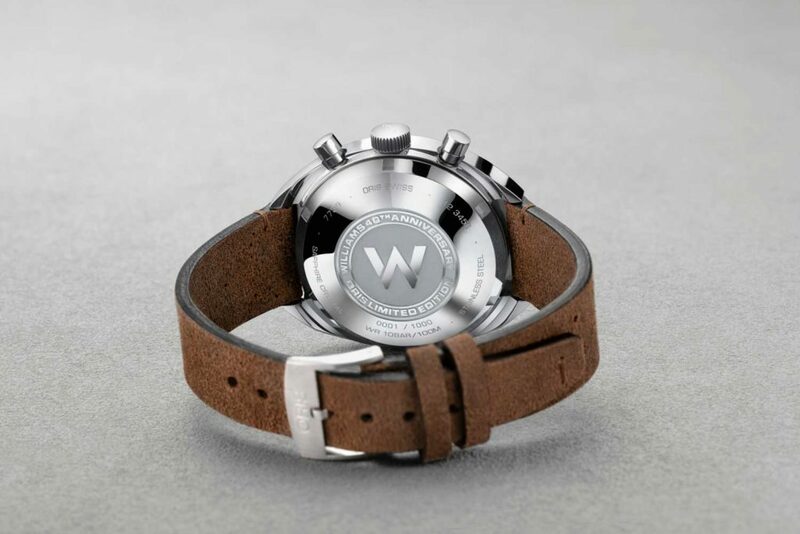 It’s also worth noting that its one of VERY few watches tied to a brand partnership that you can’t tell has said connection without flipping over to its caseback. I’m an F1 fan, for sure, but Williams isn’t necessarily the camp I’m rooting for (Sauber and Raikkonen for the win in ‘19), yet I would have no issue with the Oris Chronoris Williams 40th Anniversary having a home in my permanent collection – something that cannot be fathomed with any of the Bentley, Ferrari, or Range Rover collaborative watches on the market these days. Without flipping the watch over, you’d hardly know that this watch was a tribute to the Williams Racing F1 team (Image: Oris).